Also, if you're developing on Windows using Visual Studio 2017, the Prerequisites with Visual Studio 2017 section goes in more detail about minimum versions supported for .NET Core development. For download links and more information, see .NET downloads to download the latest version or .NET downloads archive for older versions. .NET Core 1.1 and earlier versions require the Visual C++ Redistributable when running on Windows versions earlier than Windows 10 and Windows Server 2016. This dependency is automatically installed by the .NET Core installer. Installing .NET Core with the installer script. Deploying a self-contained .NET Core application. Building the product from source. Installing .NET Core via a .zip file. This can include build/CI/CD servers. Make sure that your Windows installation is up-to-date and includes KB2999226, which can be installed through Windows Update. If you don't have this update installed, you'll see an error like the following when you launch a .NET Core application: The program can't start because api-ms-win-crt-runtime-1-1-0.dll is missing from your computer. Try reinstalling the program to fix this problem. In addition to KB2999226, make sure you also have KB2533623 installed. If you don't have this update installed, you'll see an error similar to the following when you launch a .NET Core application: The library hostfxr.dll was found, but loading it from C:\<path_to_app>\hostfxr.dll failed. .NET Core 3.0 Preview 3 has the same prerequisites as other versions of .NET Core. However, if you want to use Visual Studio to create .NET Core 3.0 projects, you must use the Visual Studio 2019. Visual Studio 2019 can be installed side-by-side with other versions of Visual Studio without conflict. 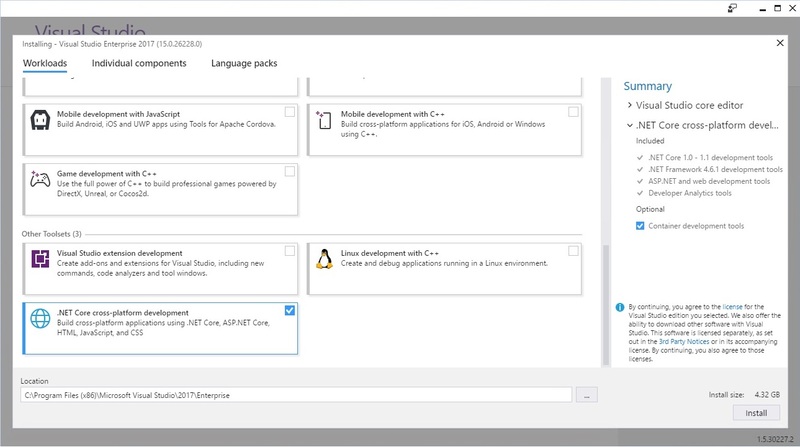 You can use any editor to develop .NET Core applications using the .NET Core SDK. Visual Studio 2017 provides an integrated development environment for .NET Core apps on Windows. You can read more about the changes in Visual Studio 2017 in the release notes. Download and install Visual Studio 2017 version 15.9.0 or higher with the .NET Core cross-platform development workload (in the Other Toolsets section) selected. 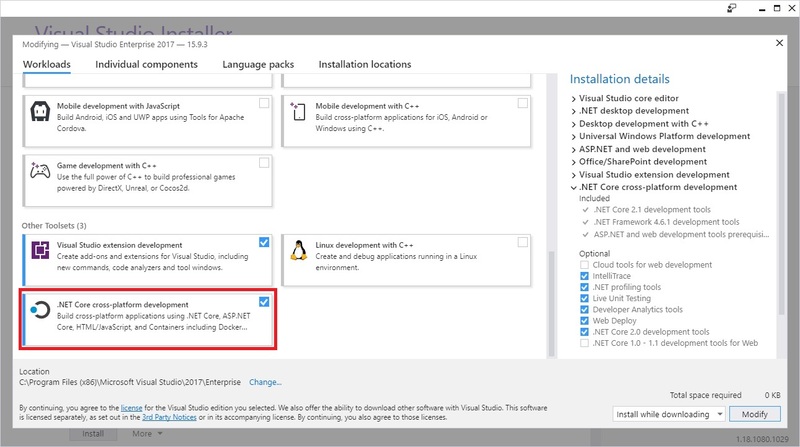 After the .NET Core cross-platform development toolset is installed, Visual Studio usually installs a previous version of the .NET Core SDK. For example, Visual Studio 2017 15.9 uses .NET Core 2.1 SDK by default after the workload is installed. Install the .NET Core 2.2 SDK. On the Project menu, choose Properties. In the Target framework selection menu, set the value to .NET Core 2.2. Open, build, and run existing .NET Core 1.x and 2.x projects. Retarget .NET Core 1.x and 2.x projects to .NET Core 2.2, build, and run. 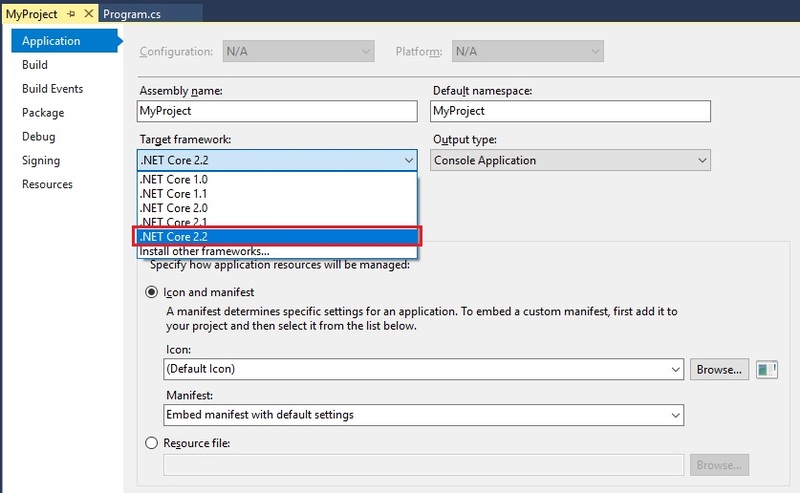 Create new .NET Core 2.2 projects. To develop .NET Core 1.x apps in Visual Studio, download and install Visual Studio 2017 with the ".NET Core cross-platform development" workload (in the Other Toolsets section) selected. The .NET Core tooling is a preview version, which is not supported. The projects are project.json-based, which is deprecated. For more information about the project format changes, see High-level overview of changes. On the Help menu, choose About Microsoft Visual Studio. In the About Microsoft Visual Studio dialog, verify the version number. For .NET Core 3.0 Preview 3 apps, Visual Studio 2019 version 16.0 or higher. For .NET Core 2.2 apps, Visual Studio 2017 version 15.9 or higher. For .NET Core 2.1 apps, Visual Studio 2017 version 15.7 or higher. For .NET Core 1.x apps, Visual Studio 2017 version 15.0 or higher.